Education professor John-Tyler Binfet poses with Frances. The pair has offered a drop-in animal-assisted therapy program at UBC Okanagan for five years. As students prepare their return to the classroom, many are searching for strategies to improve their mental health and manage the stress that can come with a rigorous study and project schedule. Research from UBC’s Okanagan campus has found that brief, but concentrated animal therapy sessions can significantly improve mental health and may be a valuable tool for students to better manage stress. Binfet notes that attending post-secondary can be a highly stressful experience. For some, it means moving away from home for the first time and leaving pets behind, along with increased academic expectations, time-management challenges and new social demands. For the past five years at UBC Okanagan, Binfet has offered a drop-in animal-assisted therapy program called B.A.R.K. (Building Academic Retention through K9s). 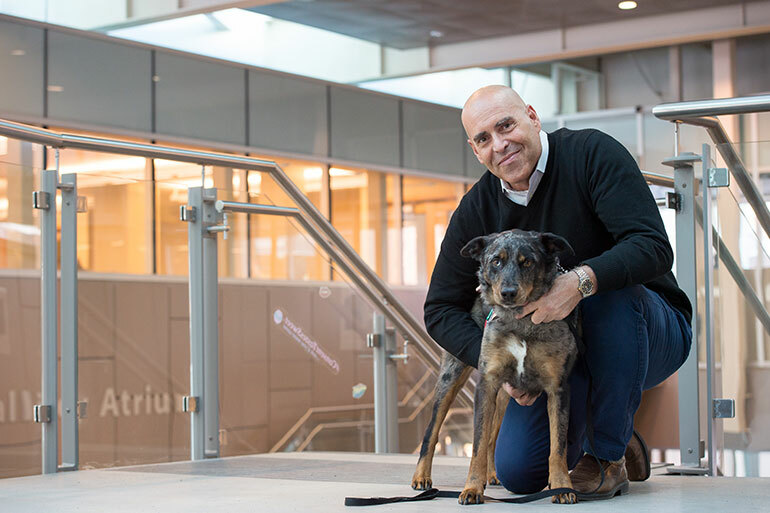 His program was recently cited in Psychology Today as one of the most innovative, and largest, pet therapy programs at a post-secondary institution. Previous B.A.R.K. research proves canine therapy works, and for his current research Binfet wanted to know how much time was needed to start seeing results. Participating students completed a brief demographic survey along with pre-and post-stress, homesickness and belonging measures. Results were published this summer in Anthrozoös, the top Human-Animal Interaction journal, identifying that just 20 minutes with a therapy dog resulted in significant reductions in stress and homesickness compared to control participants. “I’m actually at the point where I’m telling parents ‘If you want your child to keep his/her stress in check and succeed at university make sure they are aware of, and use, animal therapy if it’s available at their school,’” Binfet says. Elevated levels of stress have been associated with anxiety and depression. According to a national survey of colleges and universities, more than 50 per cent of students in post-secondary environments report feeling hopeless, and of that group 40 per cent report high depression levels. Although more research is needed, he agrees animal-assisted therapy programs could be a useful way to support mental-health initiatives in post-secondary school environments. More information about Binfet’s research can be found at barkubc.ca.